There is absolutely nothing better than heading out into the woods on a hunting trip with your trusty shotgun. Well, that is until you start adding upgrades to it. Once you do that, your entire shotgun experience can easily go from being good to being downright amazing. From sights to stocks and flashlights, there are so many options available for upgrading your shotgun. And if you love shotguns as much as I do, then you probably want to get the most bang for your buck every single time you pull the trigger. And that’s why we’ve decided to save you a little bit of legwork and round up all the best Mossberg 500 upgrades out on the market in 2018. So, if you’re ready to jump into our list and start tinkering with your gun, let’s get started! Looking to replace your current Mossberg 500 beaded sight? Look no further than the Big Dot Front Sight from XS Sight Systems. Made for both daytime and nighttime use, the XS Big Dot gives you a nice large bead to focus on during the day but glows bright green at night. The glow the sight puts off in low or no-light conditions is all thanks to Trijicon Tritium vials built into the core of the sight. The overall build quality is stellar, and it can really take a beating. I have personally put this thing through the ringer and it just keeps on working flawlessly for me time and again. Installation of the XS Big Dot is extremely simple and straightforward. All you need to do is epoxy the sight right over the top of the front bead sight that came factory-installed with your shotgun. Then, make a few adjustments to make sure it is level and you are ready to go hunting. The XS Sight Systems Big Dot Front Sight is available for plain barrels, vent ribs, and dovetail design barrels. Mesa Tactical is a company that easily ranks somewhere in the top 5 of my favorite places to buy Mossberg 500 upgrades. They produce some really innovative and durable accessories for a small range of Mossberg and Remington shotguns, as well as a few things for the FN SLP. The SureShell Carrier, however, is the one shotgun accessory that has all the shotgun upgrade enthusiasts talking. Unlike other side-mount shotshell carriers, the SureShell Carrier is made of aluminum instead of the more common polymer version. You’ll never have to worry about cracking or scuffing up your carrier again thanks to this sturdy aluminum construction. The entire carrier is hard coated with an anodized black matte, and the inner ring on each shotshell slot contains a rubber friction system to keep your shells in place. 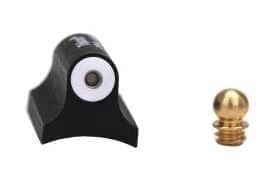 Mounting it to your shotgun is as simple as screwing in 2 Chicago screws to your drilled or tapped receiver holes. 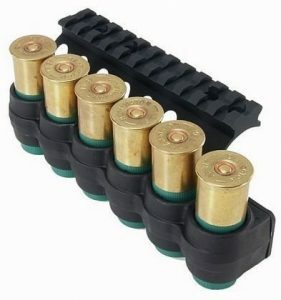 For the Mossberg 500, this shotshell carrier comes in your choice of either 20 gauge or 12 gauge with the option of holding either 4 or 6 shells. Coming in at number 3 is easily one of my favorite Mossberg 500 upgrades on the market right now. The SureFire LED WeaponLight is a flashlight that has been designed specifically to completely replace your original Mossberg 500 forend with a 14” barrel or a 6 ¾” forend tube. This may be a big commitment for anyone who has never played around with the idea of replaces their forend with an aftermarket accessory, but believe me when I tell you, it is totally worth it and it’s super easy to install it yourself with just a little bit of the good ole elbow grease. The light inside the casing is a high-efficiency LED emitter that will never burn out like the more common filament-based bulb. Don’t let that fool you though, this LED light features a maximum output of 80 lumens. 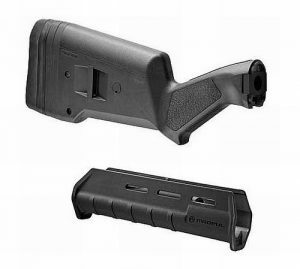 To turn it on and off, there are two switches on the left-side of the forend tube that you will use. These switches also feature a momentary-on pressure pad on the left-side and a constant-on rocker on the right. 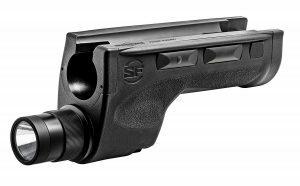 The build quality of the forend tube is on par, if not better than, the forend that comes standard with your Mossberg 500. It is made of high-strength aerospace aluminum with Mil-Spec anodizing, and an impact resistant polymer. I love my Mossberg 500 Persuader, but the stock that it came with from the factory was just never comfortable enough for me. Needless to say, it soon got replaced with this Magpul Stock and I have never looked back. This is one of the most ergonomic stocks that I own currently. Not only does it feel great against my shoulder and handles recoil like a champ, but it also weighs just a bit less than the standard Mossberg 500 stock. As an added bonus, it fits in most of my shotgun scabbards nicely. This forend will not fit a Mossberg 500 with a 6-1/2” action tube assembly, the Maverick, or any Mossberg 500 with a pinned-in action tube assembly. There are some workarounds that other Magpul stock owners have suggested if you search online, but we can make no claims about how safe or beneficial they will be. I’m a big fan of my Nikon Prostaff Hunter scope. For the most part, it has a permanent home atop my shotgun, and it has put in several hundred hours already. But sometimes I just don’t need it, and it adds a little bit of extra weight to my gun. When I’m doing some short-distance hunting, there is just no real need for me to pack something like my Leupold. For times like that, I keep a Meopta Meosight III in my hunting pack. The viewport lens on this red dot sight is only 17mm which is just a tad larger than the size of a standard set of dice. This means that it is just large enough to give you a nice wide view of your target without adding too much to the profile of your gun. The red dot is crisp and clear with minor blurring around background objects. A power button on the front of the sight controls the red dot, however, it does have a self-kill feature that turns off the red dot if you don’t use the function selection button in 3 hours. If you do find yourself wanting to test the limits of the battery life this thing uses, I can save you some time. If you were to run this scope around the clock, you’d get right around to about 35-40 days before the battery finally dies. 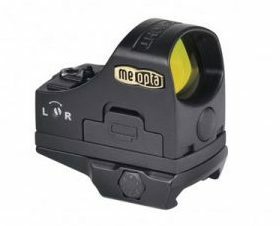 The one thing the Meosight III has that a lot of other sights in this price range don’t is the addition of a battery door that slides out to make battery replacement quick and painless. You don’t have to remove the sight or unscrew anything at all. Just slide the door out, change your battery, and now you are good for another couple months. Shotguns are extremely versatile firearms that always deliver a very powerful bang for your buck. But with any of these Mossberg 500 upgrades that we have talked about in this article, you can easily add a whole new level of versatility to your shotgun. In this review, we have rounded up all the Mossberg 500 upgrades that we believe to be the absolute best of the best that you can throw on your shotgun in 2018. If there are any sights, grip upgrades, or other attachments that we’ve left out but that you use regularly and would recommend to a fellow Mossberg 500 owner, please let us know about it in the comments section below. You may just see it come up on a future review. Thanks for these suggestions. I personally use a Shockwave with brace, and fire minishells with the OPSol Flex adapter. I have been looking for the best upgrades geared toward home/car defense, with an eye towards women and seniors. Perhaps in the future, you could pull together a set up that would work best for this population.